Sir John Chandos, Viscount of Saint-Sauveur in the Cotentin, Constable of Aquitaine, Seneschal of Poitou, was a medieval English knight who hailed from Radbourne Hall, Derbyshire. Chandos was a close friend of Edward the Black Prince and a founding member and 19th Knight of the Order of the Garter in 1348. Chandos was a gentleman by birth, but unlike most commanders of the day he held no inherited title of nobility. Jean III de Grailly, Captal de Buch,, was a Gascon nobleman and a military leader in the Hundred Years' War, who was praised by the chronicler Jean Froissart as an ideal of chivalry. The Battle of Nájera, also known as the Battle of Navarrete, was fought on 3 April 1367 near Nájera, in the province of La Rioja, Castile. 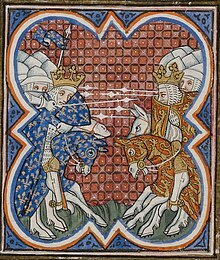 It was an episode of the first Castilian Civil War which confronted King Peter of Castile with his half-brother Count Henry of Trastámara who aspired to the throne; the war involved Castile in the Hundred Years' War. Castilian naval power, far superior to that of France or England, encouraged the two polities to take sides in the civil war, to gain control over the Castilian fleet. John Hastings, 2nd Earl of Pembroke, KG (1347–1375), was a fourteenth-century English nobleman and soldier. He also held the title Baron Abergavenny. He was born in Sutton Valence, the son of Laurence Hastings, 1st Earl of Pembroke, and Agnes Mortimer. His father died when John Hastings was only a year old, and he became a ward of King Edward III whilst remaining in his mother's care. The King arranged for John to marry Edward's daughter Margaret in 1359, which drew John into the royal family. However, Margaret died two years later. John Hastings inherited his father's earldom, subsidiary titles and estates in 1368. The same year he made a second marriage, to Anne, daughter of Walter, Lord Mauny. The following year Pembroke commenced the career in royal service that was to consume the rest of his life. The Hundred Years' War had recently reignited in France, and in 1369 Pembroke journeyed to Aquitaine. Guichard (IV) d'Angle, Earl of Huntingdon, KG was a Poitevin knight, a Knight of the Garter and a companion of Edward the Black Prince. He was born in a noble family from Angles-sur-l'Anglin in North-Eastern Poitou, sometime between 1305 and 1315. Sir Thomas Felton K.G. 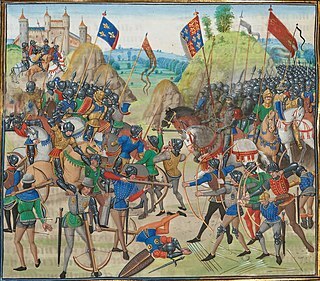 fought at the Battle of Crecy in 1346, and the Capture of Calais in 1347. He was also at the Battle of Poitiers in 1356. He was a signatory to treaty of Bretigny in 1360. In 1362 he was appointed seneschal of Aquitaine. He accompanied the Black Prince on his Spanish campaign. He was taken prisoner by Henry of Trastamare's forces in 1367. In 1372 he was appointed joint-governor of Aquitaine and seneschal of Bordeaux. He caused Guillaume de Pommiers and his secretary to be beheaded for treason in 1377 and was made a Knight of the Garter in 1381. The Reims Campaign took place during the Hundred Years' War. 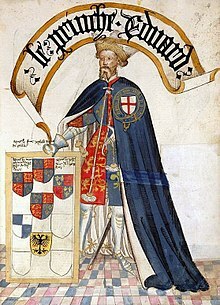 It occurred after the French de facto government rejected the terms of the Treaty of London and consequently Edward III of England organised and commanded an expeditionary army to gain by force what he had failed to win by diplomacy. On 28 October 1359 Edward landed at Calais, and advanced to Reims, where he hoped to be crowned king of France. The strenuous resistance of the citizens frustrated this scheme, and Edward marched into Burgundy, and then he made his way back towards Paris. 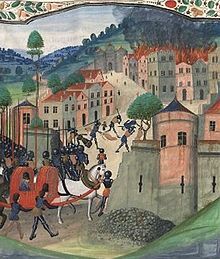 Failing in an attack on the capital, he was glad to conclude, on 8 May 1360, preliminaries of peace at Brétigny, near Chartres. This treaty, less onerous to France than that of London, took its final form when Edward and John ratified the treaty in Calais on 9 October 1360. 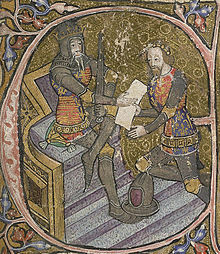 By it Edward renounced his claim to France in return for Aquitaine and other French territories in full sovereignty.